DETROIT – From the start of our test drive of the 2017 Buick Encore crossover, we were surprised. It looked short and stubby and that suggested that its ride would be bumpy. It wasn’t. The ride was smooth, the vehicle rolled over the bumps in the road without the hop associated with small cars and the Encore was quiet and well put together. It went over defects in the road with the thud of quality construction. It had a MacPherson strut with coil-over spring, direct acting stabilizer bar and a steel six-point rigid attachment front cross member suspension in the front. And a compound crank, coil springs with twin tube shock absorbers in the rear. Combined with a 100-inch wheelbase, this setup gave the Encore a ride befitting a vehicle with a much longer wheelbase. The compact crossover had electric powered rack and pinion steering that provided a little feel for the road. The only quibble we had about handling was the steering wheel; it could have been a little thicker. But that may have been conducive to someone (women) with smaller hands. The test vehicle was powered by a 1.4-liter turbocharged four-cylinder engine with variable valve timing. It made 153 horsepower and 177 pound-feet of torque at 2,000 rpm. This setup got 26 mpg in the city, 31 mpg on the highway and 28 mpg combined. That was for the all-wheel-drive version of the Encore which we had. There is a standard engine without VVT that makes about 20 horsepower less and about 30 pound-feet less torque than our engine. It amounted to 11 percent more horsepower and 20 percent more torque. That may not sound like much but it makes a difference. 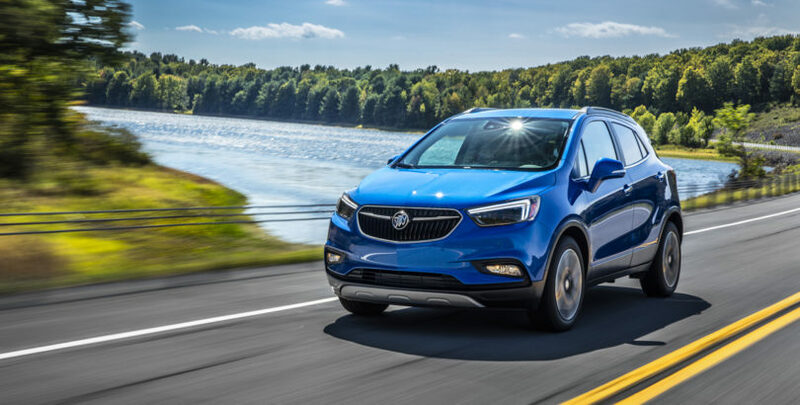 Our 2017 Buick Encore had plenty of oomph. We had to get on it once, and the Encore moved with authority, getting us out of harm’s way. Sometimes, defensive driving means aggressive acceleration. For 2017, the Encore got a new sculpted front end with restyled headlights, LED daytime running lights, a new hood and new front fenders. The exterior came as close as we’ve seen on a production vehicle of having no overhangs. That probably had much to do with its 100-inch long wheelbase that certainly had much to do with its smooth ride. Buick also redid the interior of the Encore. The instrument panel was redesigned with a new gauge cluster and 4.2–inch color driver information package between the odometer and speedometer. The fuel and temperature gauges were above and it presented a horizontal crescent instrument pod that was easy to read. We climbed into the backseat and found plenty of head room as well as legroom. However, we don’t think three people sitting in the backseat would be comfortable. Still, we noticed that the back seat cushion would slide forward and stand upright at the back of the front seat, allowing the seat back to fold forward and create a flat cargo floor after taking the headrest off. What’s more, the front passenger seat folded forward to create even more cargo space for those long items that can be awkwardly shaped. In all, the Encore had 48 cu. ft. of cargo space. Buick’s engineers really gave the 2017 Encore a lot of creature comforts that you would expect in a premium vehicle. There was a smart key, thus the car had pushbutton start/stop but also pushbutton lock and unlock on all four doors. It had stop/start technology that was really not intrusive to the driving experience. It was so sensitive that the system could detect rolling stops and it wouldn’t shut the engine off. It worked so well, that engineers decided not to give the driver the option of shutting it off. We disagree. Anything that can be turned on the owner should be able to turn off. It is a principle sort of thing. We found a couple of little things to quibble about. We thought the power seat cushion manual seatback cushion was, well, we just didn’t understand the philosophy. Make the seat manual adjusting or power adjusting, not half and half. In the storage bin below the climate controls on the center stack, the angle was so sharp to see the USB and auxiliary jacks as well as the 12V plug that Buick labeled the edge of the bin door. However, we were pleasantly surprised by the 120 volt grounded plug at the base of the center console in the backseat. The 2017 Buick Encore had its own wi-fi hotspot. Part of the connectivity system was that text messages could be received and sent. Of course there was a navigation system, satellite radio, voice controls, a rearview camera with cross traffic alert, blind spot warning and an on demand all-wheel-drive system. For 31,220, the 2017 Buick Encore Touring was a pretty good buy.